Woot woot! The week is (almost) over!! Man, why do shorter weeks always feel longer? It's unfair, I tell you. UNFAIR. But freakishly-long-feeling weeks aside, it's Friday, which means that it's nail files day!! And there's nothing like a fun mani to make things awesome, right? Note: That question was obviously rhetorical. I bought some new nail polish this week (inspired by Kimberly, who recently went on a buying binge--uh, thanks? Haha!) 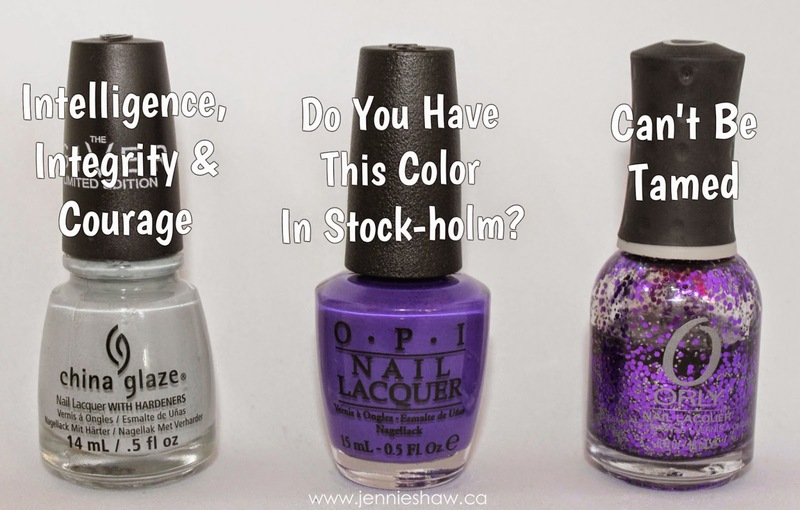 and two of the four colours I picked up were Intelligence, Integrity & Courage from China Glaze's Giver Collection, and Do you Have This Color In Stock-holm? from OPI's Nordic Collection. And holy moly, guys. HOLY MOLY. They're both awesome. In particular, I think that Intelligence, Integrity & Courage is the best grey I've ever found. The first coat was a streaky nightmare, but the second totally evened it out. As for Do You Have This Color In Stock-holm?, it reminds me a lot of Julep's Eden, which is perfectly fine because I loved Eden. The bummer is that it goes on the same as Eden too, meaning that you need three coats to have no streaks. However, it's a freaking gorgeous purple so I can forgive its shortcomings. Haha! Okay, so how this mani went down was two coats of Intelligence, Integrity & Courage and Do You Have This Color in Stock-holm?. When that was dry, I added one coat of Can't Be Tamed to my pointer finger, and sealed all fingers with top coat. Later in the afternoon, I added the studs and gems, and then did another coat of top coat. I was late to the game with the Giver Collection and I didn't get to see many of the colours in person but with how much I love this grey, I think I'll head on over to Nail Polish Canada to get the soft pink. Has anyone seen that one? Is it really the perfect shade of pale pink? My fear is that it'll take three coats and I need to mentally prepare myself if that's the case. Haha! And what are you rocking this week? Link up and show off! There you go--knocking it out of the park all over again. This is stunning, friend! And I've really been loving the dusty bluish tinted light greys lately!! Obsessed with this mani! I really like the Orly polish. Ermergerd, I looooove a good grey polish! Some of my favorites are also from CG. And what a gorgeous deep purple! I have not bought China Glaze polish in a long time!! I love that purple, and the color combo!!! I NEED TO HAVE "Do you Have This Color In Stock-holm?"!!!! That is my purple!!! So glad that I inspired you to shop/spend $. haha. That purple is so pretty. So I'm going to try to not buy polish in Sept, but I'm having my hair done soon & they sell mini OPI's cheap. So hopefully I can be strong. I did a Nail files post last week, but my computer is just nutso. It's driving me crazy. It freezes up when I go on different sites/blogs. So I didn't link up, but I did a post. I gave up trying. It took me forever to do a post today. Ugh. And yu're so right- it's like an extra-dragging week except I keep misunderstanding what day it is. Ack! I feel like your mani is the herald of fall. It's got some foggy-morning undertones with a bit of Halloween sparkle. And as alwaysm you got this studs lined up perfectly. How do you do that? !